Okay readers; talk to me. When you think of the holidays what do you think of? Personally, I think of potato latkes, candy canes, the smell of pine, aggressive and overly hostile mall shoppers, and gingerbread houses. I don't really like the taste of gingerbread, but those little houses sure are fun to make (mainly because I am a candy addict and I love to eat the trim - the frosting is good too). With gingerbread houses everyone can be an architect. Do you have an itch to design a beautiful, edible building? Click here for a recipe and step-by-step instructions from Simply Recipes.com. 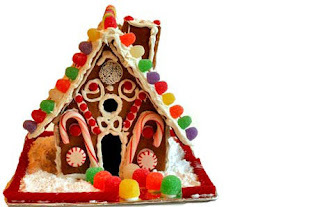 Candy addiction or not - gingerbread houses are a fun way to be creative during the holiday season. Have you created a unique gingerbread house that you would like to share? If not in the past, maybe this will be your first year. Email me a picture (joslyn@functionatl.com) and I will post it on the blog.